Wait. That can't be right. The Yankees are in Houston...so. Wait, is that the ASTROS TEAM STORE? 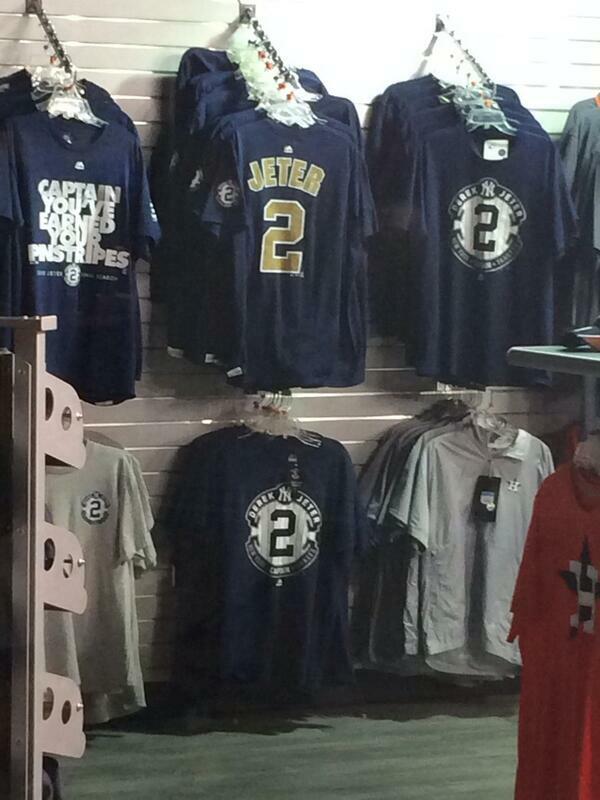 SELLING ALL THAT DEREK JETER GEAR? Look, I get it. Times are tight. CSN Houston owes the Astros $36m and counting, with no timetable as to when the Astros will actually get their television revenue. Yankees Fan money spends the same as Astros Fans money. But the Astros have to stop doing this. Remember when the Astros were playing Sweet Caroline when the Red Sox were in town and serving clam chowder? I thought the team left the Bush League behind. They really should carry Rangers gear when they hit town, as the Rangers bring the fans in. After all, they are the only team that is broadcast in the area. My guess is that the same Jeter gear will be available in every park he visits this year....the real test will be whether it makes it to Fenway ! weren't they honoring Jeter that night? I have seen Cardinals gear in the team store before. Haha I love my Astros but Crane doesn't. When will you people accept that ? He cares about Money, the end. Most in Houston have figured that out which is why they aren't going to games.. The 2nd home game of the season was set up entirely for Yankees fans, he catered to them. Let that sink in. I bet you see black helicopters often and have a tin hat in your nightstand.